"That part of the world is a cauldron of conflicting intrigue and one or other interests concerned probably knew that Mr Gareth Jones knew too much of what was going on... He had a passion for finding out what was happening in foreign lands wherever there was trouble, and in pursuit of his investigations he shrank from no risk... I had always been afraid that he would take one risk too many. Nothing escaped his observation, and he allowed no obstacle to turn from his course when he thought that there was some fact, which he could obtain. He had the almost unfailing knack of getting at things that mattered." London Evening Standard, quoting former British Prime Minister David Lloyd George, 26th August 1935. For a brief biography of his life, please CLICK HERE. 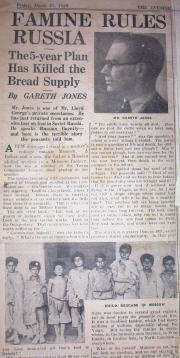 In celebration of his life, Gareth's niece, Dr. Margaret Siriol Colley and his great nephew, Nigel Linsan Colley have written & published a critically acclaimed book Gareth Jones - A Manchukuo Incident - which investigates the political intrigue surrounding Gareth's murder by Chinese bandits in 1935. Soviet Famine Exposure - London Evening Standard, 31st March 1933. Exposé of 1933 Soviet Ukrainian starvation. The Rise of Hitler's Germany. 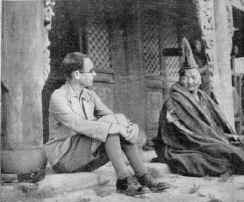 Impressions & Interviews in the Far East in 1935. America, War Reparations & Roosevelt's 'New Deal'. In Search of News - Retrospective of The Western Mail articles. Rural Wales in the Summer of 1933. Prophesy of World Politics Through the Thirties, 31 Dec 1930. Confidential Interview in 1933 with the Soviet Foreign Minister, Litvinoff (Litvinov), regarding Soviet Foreign Policy which Correctly Predicted All the Major Events which Led to the Second World War. Finally a Series of Three 'Lost' 1935 & Most Vitriolic Anti-Stalinist Articles, Personally Commissioned by Randolph Hearst, where Gareth First Coined the Term "Man-Made Famine" to describe the Holodomor (to be found in the second article).